Guillaume Corpart outlines the current and future health environment in the region, pinpointing the markets ripe for development in this first of a two-part series. A decade of prosperity in Latin America, fuelled by the high price of commodities, has been followed by a recent downturn. The economic slowdown in China, coupled with a drop in the price of oil, triggered a 12 per cent devaluation across the region’s six major currencies between 1 November 2014 and 10 March 2015. However, understanding the evolving context and the impact on healthcare systems, payers and patients is key to gaining a competitive edge and winning in this market, which has over 16,000 hospitals and nearly 600 million people. The macroeconomic environment is the backdrop to other major changes taking place. Most notably, the demographic dividend which will bolster the region’s economy for another two or three decades, the prevalence of chronic diseases and the correlation with obesity, as well as technological innovation which may play a greater role in healthcare in years to come. In the 1950s Latin America was characterised by a relatively high population growth rate of 2.8 per cent. Urbanisation, greater access to education and a larger proportion of women in the workforce have lowered population growth to this year’s historic rate of only 1.2 per cent. The expansion and modernisation of healthcare access continues to lower mortality rates in the region, raising life expectancy levels to near North American rates. 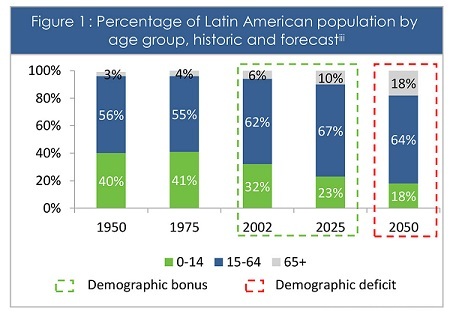 With fewer mouths to feed and more wage earners in the average home, Latin America is embarking on a 20 to 30-year demographic ‘sweet spot’. The Economic Commission for Latin America and the Caribbean (ECLAC) predicts that the elderly (population aged over 65) will rise at a rate three times higher than the growth rate for the population as a whole in 2000-2025 and six times higher in 2025-2050, representing 136 million people by 2050. Japan, the US and Europe have already had to face transformation of health systems brought on by an ageing population. In all three markets, the share of GDP spent on healthcare services and products has risen. In none was public health infrastructure sufficiently robust to cope with growing demand, so private enterprise stepped in, particularly in non-hospital care such as clinics, ambulatory services, hospice care, nursing facilities and home care. That opened the market for private healthcare to help pay for the ‘non-essentials’ that the public system could not afford. Latin America’s fiscal discipline, or lack thereof, is likely to prevent public health from adequately addressing the additional costs of an ageing population. That paves the way for massive potential growth in the private sector in fields such as telemedicine, healthcare IT, medical devices and medical technologies that help personalise medicine or improve the efficiency of doctors and nurses. Chronic diseases represent over 60 per cent of deaths worldwide, with leading causes being cardiovascular disorders, diabetes, cancers and chronic respiratory diseases. Obesity is at the heart of the discussion around these deadly diseases as it is a trigger for chronic health conditions such as diabetes, high blood pressure and high cholesterol, while also increasing the likelihood of the onset of heart disease, strokes, certain forms of cancer and respiratory and gastrointestinal diseases, among others. Obesity is estimated to be responsible for 1-3 per cent of total health expenditures in most countries, while accounting for a whopping 5-10 per cent in the US. 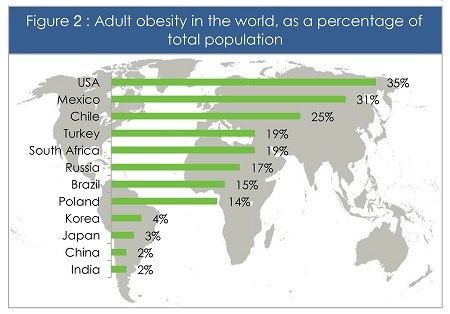 Mexico has the highest obesity growth rate in the world and has the highest proportion of child obesity and the second highest proportion of adult obesity globally. In response to this, in 2013 the Mexican government launched one of the most comprehensive strategies to address the problem, including awareness-raising, healthcare technologies for physicians, regulatory measures affecting food advertising, labelling of processed food, as well as taxation of unhealthy foods. The results of such a campaign will probably increase awareness – and thus early detection – of obesity. Prevention remains a vast area of opportunity throughout Latin America, a region typically characterised by high calorie diets, insufficient exercise and sedentary lifestyles. It is estimated that diabetes currently affects over 15 million people in Latin America, a number that will reach 20 million by 2023. • As awareness and detection increase, the need for diagnostics equipment required for blood tests and analysis will follow, and demand for oral medication, insulin and other injectables, is set to grow. • In the coming years, both local and international laboratories will see an increase in demand for drugs designed to treat cancer, diabetes and heart diseases. However, the high costs of certain specialised medication may hamper their expansion, notwithstanding the need for these new treatments. Demand in these healthcare segments will boost local manufacturing of medication, which is expected to keep growing, placing further strain on international laboratories. Given their limited R&D budgets, local manufacturers will continue to focus on the production of generics, birth control hormones, non-narcotic analgesics, antidepressants and anti-rheumatics. The convergence between healthcare and technology is making its mark globally, and is beginning to take hold in Latin America. 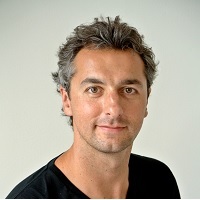 The adoption of new digital health information technologies such as electronic medical records (EMRs), telemedicine, mobile health applications, and electronic medical prescriptions will change how physicians, patients and hospitals interact, which will require adjustments to sales and marketing channels and, in some cases, entirely new business models. Notoriously slow and inefficient, public health care institutions throughout the region could stand to benefit from ‘Big Data’ analysis. The use of data management tools is one of the most exiting breakthroughs in the industry and is raising expectations among hospitals across the US and in other more mature healthcare markets. Big data analysis enables more informed diagnostics, more targeted treatment options and the detection of patterns among patients across hospitals, which yields new insights as well as potential best practices and cost savings. The data management tools being developed to extract value from big data remain costly and their use is not yet widespread, even among US hospitals. Yet early movers may reap many dividends, especially with government customers looking to save costs and increase efficiency. At the same time, technological innovation is giving rise to personalised medical care at scale. The use of mobiles and health apps is on the rise among patients around the globe: smartphone apps enable users to monitor many aspects of their health, including measuring heart rate, counting calories, and blood sugar levels. New apps also allow for more complex regimens like managing chronic diseases, such as diabetes. According to mobile tech consultancy Research2Guidance, there are now almost 100,000 mobile health apps. The top 10 apps are generating over 4 million free downloads every day. In Latin America the use of smartphones is increasing rapidly as the numbers of these devices are expected to double by 2017, representing 40 per cent of the region’s total population. The impact of the massive use of smartphones in the region, along with a new generation of tech-savvy youngsters, will enable closer interaction between hospital and patients. For example, for the monitoring of serious health conditions through alerts to prevent worsening medical conditions. 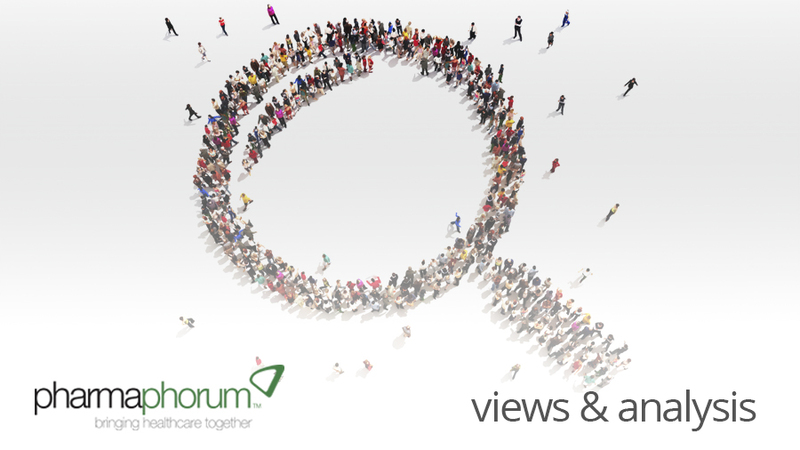 The second part of this series, to be published in May, will provide in-depth coverage of more of the opportunities for healthcare development that Latin America presents. Figure 1: The Economic Commission for Latin America and the Caribbean (ECLAC) report ‘Demographic Observatory No.3: Population projection’; the United Nations’ Economic & Social Affairs report ‘World Population to 2300’; and the report ‘Population Dynamics in Latin America’ by Jorge A Brea. Figure 2: OECD Health Data 2010 and WHO Infobase.